I read this book as an ebook on an iPhone using eReader Pro. In the second book of the series we get some more time with Thaddeus, Gloria and the new magician nicknamed Houdini. My favorite part of this story is when Ahazuerus, talking about himself and Thaddeus, explains to Houdini “We are two sides of a coin. He lacks empathy and tact, although he is slowly acquiring both. I lack drive and ambition, though I too am learning. We complement each other perfectly.” This really speaks to me; the two of them are growing together as a team and as individuals. It increases my desire to learn more about both characters and the characters that surround them. The carnival is traveling among the stars, and finding all kinds of problems that Thaddeus Flint and his crew didn’t anticipate. What use is a wild animal tamer when the audience looks more like the animals than the trainer. Who would pay to watch Butterfly Delight perform her striptease when to many of them it seems like an unappetizing snake shedding its skin? One by one, Flint and his alien partner, Mr. Ahazuerus, must tackle each problem before the show goes broke. I rate this book a 7 out of 10 and the complete series as a 9 out of 10. Like the first book of the series I read this book on a Kindle and listened to it on an iPhone switching back and forth as needed. Wow, these books are long. It took me a few weeks to make it through this one. But it was a great ride. The story goes on and on with no end in sight. The characters are holding my attention and I look forward to reading the third book, although that will have to wait until June or so as I am in non-fiction book mode now. I am still surprised by how much I am enjoying these books, especially given their length and relatively slow pace. I was able to sum up most of the various plot lines from the book to my wife in less than an hour, I left out some of the good bits so she will still have some surprises left when we watch the TV show. 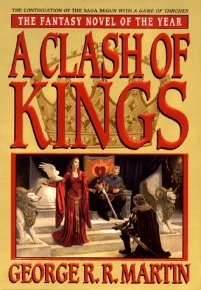 A Clash of Kings picks up where A Game of Thrones ended. The Seven Kingdoms of Westeros are plagued by civil war, while the Night’s Watch mounts a reconnaissance force north of the Wall to investigate the mysterious people, known as wildlings, who live there. Meanwhile, in the distant east, Daenerys Targaryen continues her quest to return to and conquer the Seven Kingdoms. All signs are foreshadowing the terrible disaster that is to come. I rate this book a 9 out of 10, it is even better then the first book. This story is a first for me; I both listened to the audiobook and read the ebook interchangeably. The audiobook is narrated by Roy Dotrice who does an amazing job performing all of the characters in this novel. 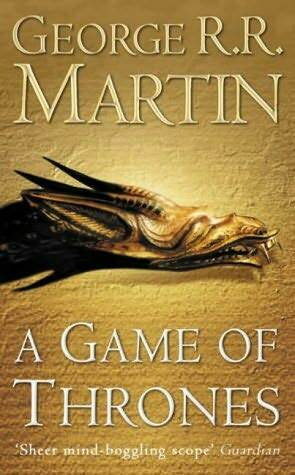 But, I enjoyed the HBO series on TV, so much so that I subscribed to HBO just to watch it, so I decided to give the book a try. I expected the book to differ greatly from the TV show, or vice versa, but I am amazed at how closely the two followed each other. The audiobook is almost 34 hours long and the TV series is less than 10 hours long but somehow they have fit everything that I consider significant into the show. It was very interesting to go from listening to the book to reading the book. The transition was not always smooth. It was not easy to find my place when going from one format to the other, but the audiobook is truly unabridged so I was always able to find my spot and continue the story. I find that it is not always polite to wear headphones, but reading from an ereader is understandable, while at times reading from an eraeder is not appropriate but headphones are fine. By switching back and forth I was able to listen and read while driving, at the grocery store, in restaurants, at friends houses, while shopping, in bed, in a bathtub, in an airport, and on airplanes. How else am I to get all of these books read? I rate this book, both audiobook and ebook an 8 out of 10. If I could only have one version I would choose the audiobook and the wonderful narration of Roy Dotrice.